Standard floor armor provides some grenade protection, but if explosive devices, like IEDs, pipe bombs and hand grenades are a major concern, consider having us install a bomb protection blanket. These blankets are designed to absorb blast impact and fragmented pieces of the bomb, thus minimizing blast impact. 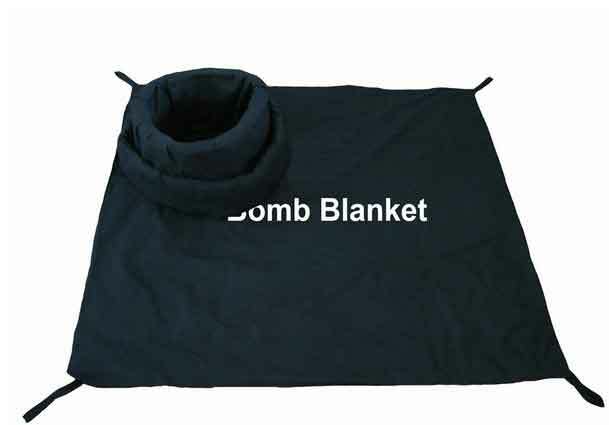 Bomb Blanket - Personal Armor "Protect yourself from flying shrapnel with our bomb blankets." Standard protection in our private and law-enforcement armored vehicles shields you from certain explosions, but for the most reliable protection against explosive devices you'll want to add a bomb blanket to your armored vehicle. These can be incorporated into the vehicle, or included as a portable option for use outside the vehicle. Bomb blankets are designed to minimize blast impact and absorb shrapnel from Improvised Explosive Devices (IEDs), pipe bombs and hand grenades. They also protect from fragmentation caused by pressure and electrical explosions. Made from layers of flexible ballistic fabrics, like Kevlar, bomb blankets are light-weight and resistant to fire, chemicals and water. Like other types of armor, bomb blankets conform to standard ballistic protection ratings. For example, Level IIIA bomb blankets are rated to withstand the blast from 2 DM-51 hand grenades or a 1-pound pipe bomb. Higher protection levels are also available. If requested, bomb blankets are integrated into your armored vehicle to increase protection against grenades thrown by an attacker, bombs planted beneath the vehicle, and driving over explosive devices. The flexible armoring material is added to the floor and sides of the vehicle in addition to standard ballistic armor. We can also install a remote starting system, which starts your car from a safe distance and lets it run for a set amount of time to protect you from explosive devices set to detonate when the vehicle is turned on. Portable bomb blankets are designed for use outside the vehicle. This type of bomb blanket is used to neutralize IEDs, in de-mining operations, and for blast suppression in high-risk government and civilian buildings. Most are light-weight enough to be carried and placed by one person, though weights will vary depending on the size and protection level. These bomb blankets are a great tool for military and law-enforcement personnel who may need to contain a suspected explosive device. Bomb blankets also work as a portable barrier or shield to protect people, and may be placed over windows or doors for extra protection from explosions and projectiles. You can also use portable bomb blankets inside a vehicle to shield passengers.